September is the National Food Safety Education Month (NFSEM). NFSEM helps educate people on food safety practices. 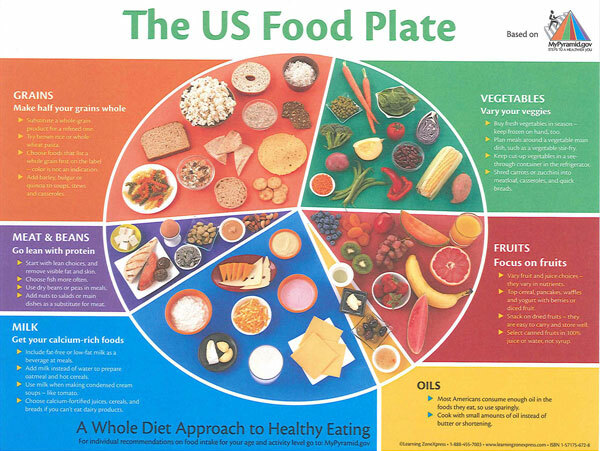 You can learn more about the educational resources offered by visiting the Food Safety & Nutritional Education Campaigns. Remember to keep your food safe from bacteria! 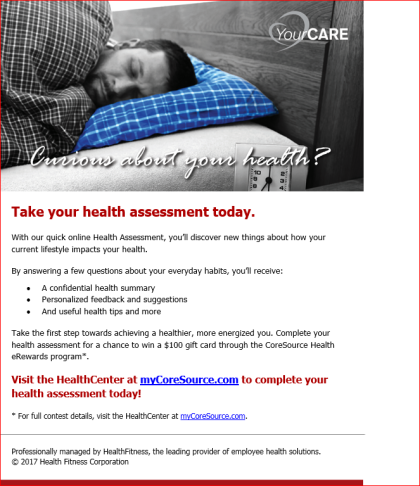 Have you taken your Health Risk Assessment? October is Breast Cancer Awareness Month-download, view and share these tips and resources with your community of friends and family. Clean your Bill of Health – Tips from the CoreSource YourCare programs-Download tips on how to reduce your risks. Fight Midlife Weight Gain to Battle Breast Cancer –Sutter Health programs -Stop the spread: sweat, build strength, watch your portions, pack in nutrients. Thanks to the 50 participants for engaging in the journey to improved fitness. Take a look at the pictures of our 2016 winners circle: summer-weight-loss-challenge-2016-winners-circle. We encourage you to keep up the good work and continue to strive towards a healthy lifestyle. Thanks again for your participation! Back by Popular Demand! The 2016 Weight Loss Challenge-Sign up now. Ready to lose weight? Sutter Health’s We Plus You Program is ready to help. 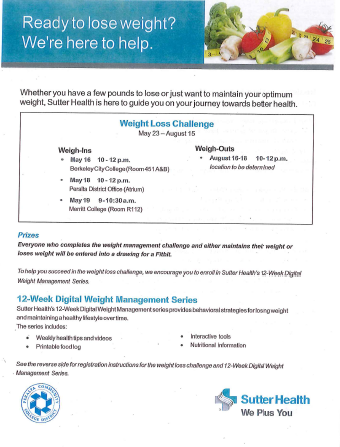 Whether you have a few pounds to lose or just want to maintain your optimum weight, Sutter Health is here to guide you on your journey towards better health. Register anytime between May 2 and 13. Click here to register for the 2016 Weight Loss Competition. All are welcome to participate and registration is open to the entire Peralta community. 2016 winners??? Will you be included? We need 20 participants – Join with a friend and let the competition begin. Breast cancer is the second most common cancer among women in the US. A panel of experts will discuss advantages of incorporating cancer treatment with acupuncture, nutrition, herbal supplements, mind-body, music therapy and hypnosis. It’s summer, which means time for outdoor fun. It’s also the time of year when it’s easy to become dehydrated. Warmer temperatures, higher humidity and increased physical activity cause you to perspire more. These fluids need to be replaced throughout the day to keep your body in balance. Click here to read more about How to Stay Hydrated This Summer. It’s never too late to change for the better. The more you know about men’s health, the healthier you – or the men in your life – will be. Get checkups. Guard your heart. Don’t smoke. Read up on these topics here at Kaiser Permanente Men’s Health. Did you know that, in addition to nurturing your body, fruits and vegetables can improve your mood? Read Sutter Health’s 5-A-Day For A Better Mood to find out more! Take advantage of a fitness benefit that encourages and supports a healthy lifestyle. Click here for 24 Hour Fitness’ Corporate Membership Rates for Peralta Community College Employees! Ready. Set. Thrive. 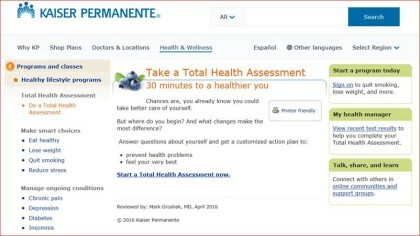 Click here for Kaiser’s Online Tools to Help You Live a Healthy Life! This new year, take the Meatless Monday Challenge for a taste of what a plant-based diet can do for your health. This link includes your week-by-week guide. Discover some ways to Love your heart every day! Be good to your heart, and your heart will be good to you. For retirement planning, please join us at the Know and Grow Campaign: Wednesday, February 3, from 9AM-1PM at the District Board Room.